Goalkeeper Joe Hart should not go to this summer's World Cup with England, says ex-Chelsea striker Chris Sutton. 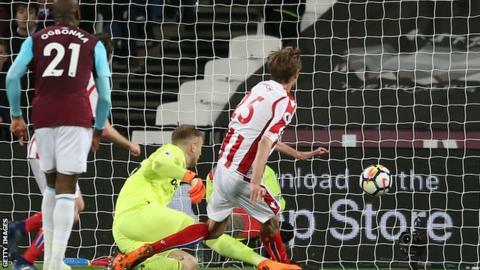 West Ham keeper Hart's fumble allowed Peter Crouch to score in Monday's 1-1 draw with Stoke, before substitute Andy Carroll volleyed a last-minute equaliser at London Stadium. "There are three better goalkeepers," said Sutton on BBC Radio 5 live. Jack Butland, Jordan Pickford and Nick Pope are all battling for a place in the squad alongside Hart. Sutton said the mistake by Hart, who is on loan at the Hammers from Manchester City, was "not an isolated incident" this season and that he has "dropped his ticket" to go to the World Cup in Russia as a result. "You cannot take someone because they are a nice bloke and good in the dressing room," added former Blackburn and Celtic player Sutton, who won one England cap. "[England manager] Gareth Southgate isn't wondering if he is a joker, is he good in the dressing room? He is wondering if he is going to make a save and keep us in the tournament. Hart impressed earlier this month in West Ham's 1-1 draw at Chelsea, making a number of crucial saves. But Sutton described the 30-year-old's fumble on Monday as "indecisive" and "woeful". "You feel for Joe Hart after what was a good display at Chelsea - he kept West Ham in the game," said Sutton. "But tonight was bread and butter. Football is harsh. "He was indecisive when that shot came in from Xherdan Shaqiri. He should have gathered it. It would have been routine for the Hart of yesteryear - but he spilled it and it was a woeful, woeful bit of goalkeeping." Sutton also disagreed with calls for team-mate Carroll to go to Russia, despite the striker coming on as a second-half substitute to score the equaliser in his first game back from injury since January. "You see the quality Andy Carroll possesses. He hardly trains, comes back into the side and changes the game," said Sutton. "He does that regularly but then he breaks down. He cannot be trusted to go to Russia despite the talent that he is." "Joe Hart is not as old as the two goalkeepers I am going to speak about were when they made mistakes at major tournaments for England. He turns 31 on Thursday. "In the semi-final in 1990 there was the free-kick from West Germany that hit the top of the wall and Peter Shilton, at 40, couldn't back-pedal and stop it, and it dropped under the bar. "In 2002, Ronaldinho caught David Seaman out in similar circumstances. They were the keepers because they were the established choice and had been number one for ever and a day. "But if Gareth Southgate doesn't trust Joe Hart he won't take him. I am not sure now. If he takes him to the World Cup and he is not the number one goalkeeper, does that become an issue Southgate could do without?" David: England's number one goalkeeper just moved back three places. Mark: That is why Joe Hart does not deserve to go to the World Cup. Appalling keeping. John: Hopefully that will end any thought of Hart going to WC 2018. Andy Phipps: It's a shame that Joe Hart doesn't make the team selections... He'd have dropped himself by now. Peter Gary: West Ham felt Hart done by. Will Cusack: Joe Hart must wash his hands with margarine. Johnny Gratehead: Joe Hart just cancelled his World Cup ticket. Iain Stuart: Oh dear, oh dear. Yet ANOTHER Joe Hart fumble costing a goal.